Christmas is just around the corner and I finally roasted it! I’ve always wanted to roast a lamb roll, boneless lamb shoulder roll to be exact, and last Sunday was the perfect opportunity for me to try this out. The boneless lamb shoulder roll was lying in the freezer and begging for a change in temperature from the freezing compartment to the oven which was just sitting across the kitchen. It was an easy roast and I complimented the meal with baked potatoes and carrots. On the table were fresh garden salad, 3 varieties of pasta, mushroom pasta sauce and juicy jumbo sausages. Dessert came in the form of ice kacang and chocolate marble cheesecake. There were 9 adults and we were literally stuffed that night. But the highlight for me that night was the lamb. It was my maiden roast and it turned out all right. Ingredients are simple and this is definitely something which a novice can try. I won’t say it’s an original recipe of mine as I got some ideas here and there and there are thousands of such recipes on the net. But it is definitely a tried, tested and given the thumbs-up recipe. Surprise your family and friends with this easy roast this Christmas! Pat dry the lamb roll. Rub the marinate all over the lamb and leave overnight in the fridge. Ensure that lamb is brought to room temperature prior to roasting. Pre-heat oven to 180° Celcius. Place lamb on rack in the middle of the oven with a tray to collect the dripping fat. Roast for 90 minutes or 30 minutes for every 500 grammes of lamb. Remove from oven and cover with foil for 20 minutes before carving. To make Sauce, slowly melt butter in sauce pan before adding flour. Stir briskly until flour becomes a rough sandy texture. Add fat dripping and liquid till the sauce turns to the consistency that you like (runny / thick). Add worcestershire sauce, salt and pepper to taste. The lamb shoulder looks absolutely delicious. I’m going to try your recipe! wow, pablo, this is a serious dish. i’ve always thought that if an amateur cook can come up with things like roast lamb or stewed beef, they have made it as a cook. and this is your first time at that. what a genius. i am salivating as i type even though it is now 230am!! Well done pablo !!!! 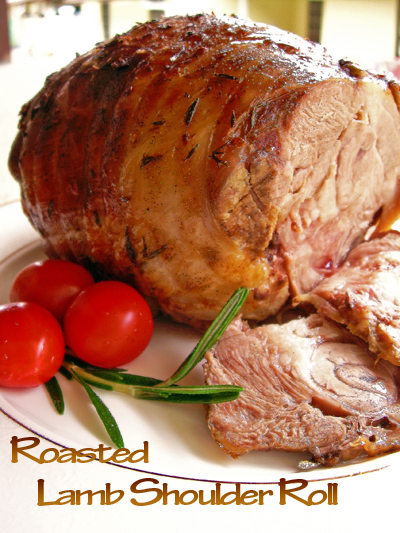 The roast looks great , I will have to give it a try soon !! hmm.. Steve will love it with some mint sauce ..yummy !! Welcome back!^^ It looks yummy indeed, with a bit pink in middle. I don’t eat lamb but I’m thinking of roasting a stab of pork just like your roast lamb, hope it turns out as good as yours. Great to see you back. Love your posts and this just looks amazing. Am sure it tastes heavenly ..yum! Pablo says : Sure feels good to be back 😀 Happy New Year everyone! Wow, how do you take such amazing photographs of food? I have been trying for sometime now, but your background, the lights, everything looks so amazing with even something at simple as soya bean drink. Care to share any tips/secrets? Sanna : Thanks for your compliments. I am only using an entry level point-and-shoot digital camera. Not any fancy DSLR cameras. Three simple tips for you would be : take the picture under natural sun lighting, use “macro” function and only focus on a portion of the food at an angle (rather than the whole plate of food). where have u been?? we missed you and your recipes a lot! your roast looked so juicy and good. happy new year to you and your family! Wahhhh….can I NOT try the recipe but the roast itself instead? I have teeth now, you know…hehe..
babe-kl : I’m still here 😀 Never left this blog at all. Just that new recipes are hard to come by with limited time and energy. LOL! Collin : Hmmm….that can be arranged 😉 Hopefully no need to wait till Christmas. Hehe! Looks great! Have you ever tried using gravy Master to make the sauce instead of Worcestershire sauce? My father in law uses them for the gravy whenever we make roast for dinner and they are great. Do they have Gravy Master in Malaysia? Hi! This looks superb! I stumbled upon your blog after searching for pineapple tarts … my lucky day, I guess 🙂 You have an amazing repertoire, very impressive! Cheers! Eh! Why all the photos you take seem very high quality? Are you using high-end camera? It is very interesting and mouthwatering when browse thru your blog. Hi there! I came back to say, I made the tart pastry using your MIL’s recipe. 🙂 You should have left a comment when you visited previously. I wouldn’t have had to take the circuitous route to your blog! 😉 Cheers!